Our neonatal unit provides care for babies born prematurely or who need some extra expert care after being born. Over 400 babies receive the expert care of the unit each year. Whilst the unit mainly cares for babies born locally, staff also take in babies from further afield as part of the neonatal network which ensures that babies get the care they need as soon as possible, even if local units are full. What kind of care is provided on the unit? 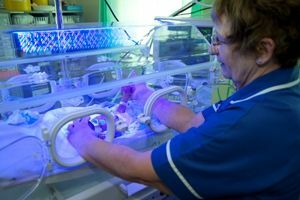 The neonatal unit provides expert, round-the-clock care for newborn babies who are ill or born prematurely. If your baby is in the hospital's neonatal unit, you are not alone. One in nine babies born in England will spend time on a neonatal unit (Bliss 2010). Special care, for babies who are catching up on growth and development after a premature birth. These babies have less serious health problems or are getting better after more complex treatment. There might also be transitional care. This happens just before your baby is ready to go home. Transitional care gives you a chance to take care of your baby yourself, but with the nurses nearby. The neonatal unit is located on the first floor of the Croft Wing at Warrington Hospital. This is located at the rear of the hospital near the Guardian Street entrance to the site. The neonatal unit at Warrington Hospital is equipped with three intensive care cots and a total of 18 spaces for a mix of high dependency and special care babies. The neonatal unit is staffed by an expert multi-disciplinary team which includes consultant paediatricians (doctors specialising in the care of children), highly trained neonatal nurses and a full support team including nursery nurses. Babies are referred directly to the unit from our labour ward if they require neonatal care. If potential problems are discovered before birth, arrangements will be made for admission to the unit direct from labour.